The Art of Fiction and Spinneyhead reminded me that today is "One Day in History" - an attempt at the biggest mass blog in history and an effort to capture a multitude of days in the life for posterity. Organisers History Matters say: "We want as many people as possible to record a 'blog' diary which will be stored by the British Library as a historical record of our national life." Behaviour of people at war memorials. Shouts and gestures of motorists. Distribution, diffusion and significance of the dirty joke. The private lives of midwives. "They intended merely to expose facts 'in simple terms to all observers, so that their environment may be understood, and thus constantly transformed,'" he says. And surprisingly, it seems the movement is still alive and kicking. "Bolton, an industrial town in northern England so bleak that even the riverbed was paved." 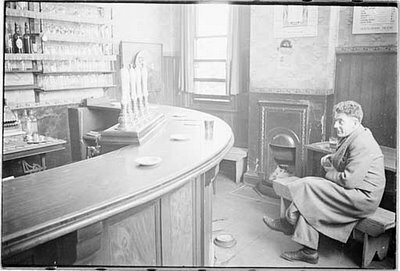 Bolton became the main hub of the Mass Observation drive; the picture above is from the Bolton Museum's archive of photography by Humphrey Spender, who documented the movement, and its caption reads: "Interior - bar, Swiss Hotel - Walter Hood, ex-miner, mass observer waits to observe customers." Anyway, get over there and start observing yourselves.